All wrestlers above have profiles on Joshi City, you can click on their name to go straight to it. I start off watching the Stardom World version of this event, but by the end I’ll be reviewing the Samurai TV version, I’ll explain why when I get there. As one would expect, the event begins with a rookie battle! Ruaka at the time of the match was 12 years old, while Hanan just turned 13. AZM is 14 and has been wrestling for several years, so she is the veteran of the group. 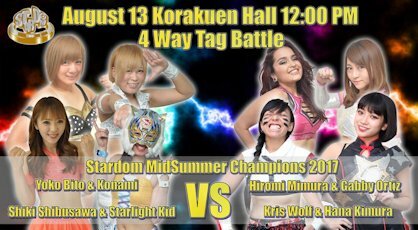 I’ve seen this same basic match 50 times in the last year, the only downside of Kaori Yoneyama moving up the card like she deserves is without a veteran presence these matches all are basically the same as you can’t expect but so much from children. Hanan and Ruaka tie-up while AZM watches, elbows by Hanan but Ruaka elbows her back. AZM gets involved, Hanan elbows her in the corner but Ruaka rolls up Hanan for two. 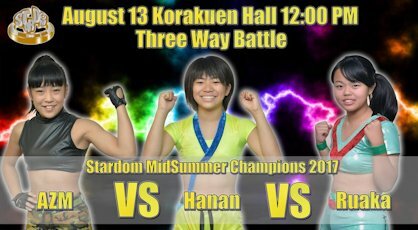 AZM tosses Hanan by her hair, AZM grabs Hanan’s arm and applies a wristlock. Hanan kicks AZM but AZM trips her and hits a dropkick. Ruaka kicks AZM from behind but AZM drops Hanan, AZM avoids Ruaka’s big boot the first time but Ruaka connects the second time for a two count. Dropkick by AZM, she throws Ruaka into the corner and delivers another dropkick. Crab hold by AZM but Hanan breaks it up, AZM and Hanan trade elbows until AZM kicks Hanan out of the ring. AZM goes for a crossbody on Ruaka but Ruaka catches her and tosses AZM to the mat, big boot by Ruaka in the corner and she hits a fisherman suplex hold for two. Hanan returns and helps Ruaka on AZM, judo toss by Hanan to Ruaka and she hits a STO. Cover by Hanan, but Ruaka kicks out. Hanan picks up Ruaka and elbows her into the corner, vertical suplex by AZM to Ruaka but Hanan quickly covers AZM for two. STO by Hanan to AZM, Ruaka comes back and they double team AZM. Hanan dropkicks AZM but Ruaka rolls up Hanan for two, she goes off the ropes but Hanan rolls Ruaka to the mat and cradles her for the three count! Hanan wins! Short and to the point, I will say that there were no issues of miscommunications here which is no small feat when dealing with a fast paced match with three really young wrestlers. I still see Hanan as the best of the bunch, but too early to really tell for any of them. At least AZM is back where she belongs on the card, so that’s one plus. The winner of this match will get the final slot in the FIVE STAR GP. To most fans, Tam Nakano is an unknown as even though she debuted last summer most of her matches were not taped since she started in Actwres girl’Z. Tam left the promotion around April and started Freelancing a bit, before signing up with GPS Promotions. She appeared in Stardom last month to cut a promo, and was invited by Oedo Tai to join their group. She didn’t, but seems to want to stick around the promotion. Natsuko is a bit better known, she is a Stardom rookie that is part of Team Jungle. A fairly even match-up, as their experiences levels are similar. Tam and Natsuko run into each other as the match starts but neither wrestler goes down, they trade elbows until Natsuko puts Tam in a headlock. Tam Irish whips out of it and hits a hard shoulderblock, but Natsuko returns the favor. Snapmare by Natsuko and she hits a dropkick, leglock by Natsuko but Tam gets into the ropes for the break. Natsuko charges Tam and dropkicks her into the corner, cover by Natsuko but it gets a two count. Tam comes back with her own dropkick, kick to the back by Tam and she applies a Dragon Sleeper. She lets go after a moment and goes off the ropes, but Natsuko hits a shoulderblock. Jumping elbow by Natsuko but Tam dropkicks her, running shoulder tackle by Natsuko and she levels Tam with a spear. Natsuko applies an armbar with a headscissors, cradle by Natsuko but it gets two. 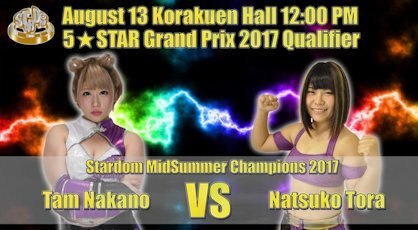 A backslide by Natsuko gets the same result, Natsuko goes off the ropes but Tam ducks the PK and kicks Natsuko in the head. Kicks to the chest by Tam and she kicks Natsuko in the head for a two count. Tam throws Natsuko into the corner and hits the Space Rolling Elbow, she follows with a Stunner and running footstomps. 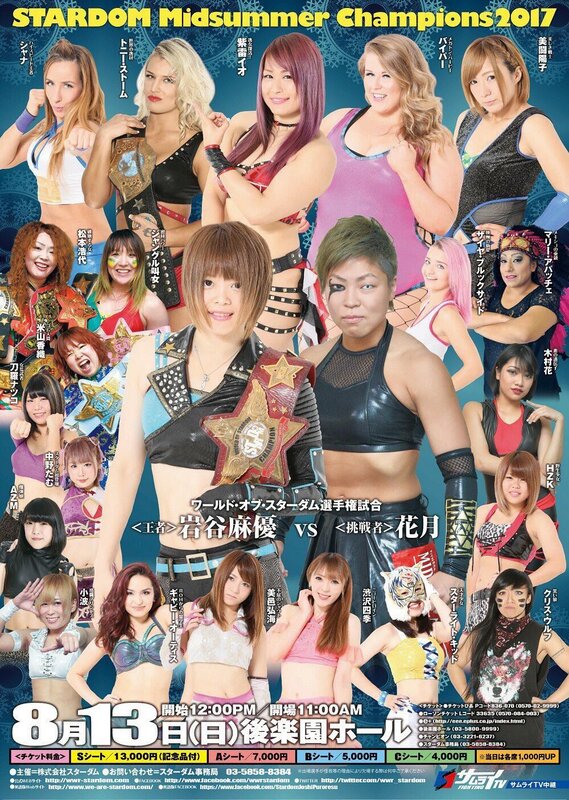 Senton by Tam, but Natsuko gets a shoulder up on the cover. Kick to the chest by Tam, she gets on the second turnbuckle and delivers a diving senton for another two count. Tam goes up top but Natsuko joins her, Natsuko gets Tam on her shoulders and hits a Samoan Drop. Natsuko goes off the ropes and knees Tam in the stomach, running knee by Natsuko but Tam kicks out. Natsuko picks up Tam but Tam blocks the slam and kicks Natsuko in the head. More kicks by Tam but Natsuko mostly blocks them and slaps her, two more kicks by Tam but Natsuko gets a shoulder up. Spinning Back Kick by Tam, and she picks up the three count! Tam Nakano wins and is in the FIVE STAR GP. So I started this show watching the Stardom World version, which is why those two matches I saw in full, but I’m switching over to the Samurai TV version now because there is something wrong with Stardom’s hard cam. Everything looks tinted and weird, which is distracting. It normally isn’t like that so I’ll assume it was just a one-time issue. Ah the “everyone that wasn’t on the card gets thrown in together” match! At least most of these teams make sense. Hana Kimura and Kris Wolf are members of Oedo Tai and both are in the FIVE STAR GP. Konami and Yoko Bito are a regular tag team these days, and they are in the upcoming tournament as well. Gabby and Hiromi are more random, Gabby has been touring with Stardom for the last couple months and is a rookie while Hiromi is still learning as well. Shiki Shibusawa and Starlight Kid are both rookies, with Shiki just debuting last month. For a Tag Team Four Way, each team has one legal wrestler in at the same time, first pinfall/submission gets the win. The match begins with Hana, Hiromi, Bito, and Shiki in the ring so naturally they have a pose off. Which Samurai TV did not clip. After everyone gets a turn they start fighting, with Hana being triple teamed in the corner. Everyone runs in to attack Hana, with them all having success except for Hiromi. Konami stays in the ring and helps Bito attack Shiki, but Starlight Kid re-enters and both deliver dropkicks to Konami and Bito. Gabby and Hiromi enter and both hit DDTs on Starlight Kid and Shiki, but Hana and Kris attack them from behind. We clip ahead to Bito hitting a double lariat on Gabby and Hiromi, Bito drops Hiromi on Gabby and covers her for two. Bito goes off the ropes but Kris trips her from the floor, Konami goes outside the ring and kicks both Hana and Kris while Gabby drops Bito with a Cyclone Neckbreaker. Small package by Gabby, she goes off the ropes but Bito kicks her in the head. Bito picks up Gabby and delivers the B Driver, but Hana boots Bito when she goes for the pin. Kris runs in and quickly covers Gabby, and she picks up the three count! Kris Wolf and Hana Kimura win! Samurai TV kindly clipped this one quite a bit. The pose off is cute and fine for a midcard thing, and I laughed pretty good when Hana booted Hiromi in the face, but nothing else here was really memorable. I am glad Oedo Tai got the win though, it may not seem like much but every pinfall counts when trying to get a faction over. Quite skippable but harmless. The next four matches on the event are all title matches. 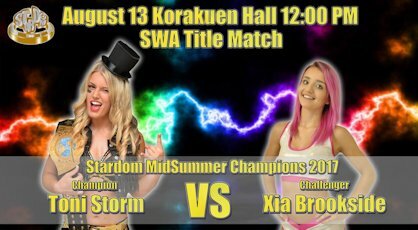 Toni Storm won the SWA Women’s Championship on July 24th, 2016, and this is her 10th defense. Toni has been pretty unbeatable in Stardom, which is well deserved since she is great. Xia Brookside is 17 or 18, depending on who you believe, and had her first match in Stardom last month. This is a really low level title defense by Toni, as there is no way she is losing to Xia, but hopefully it will still be entertaining. This match is joined very in progress, as Xia drops Toni with a spinning headscissors. Running knee by Xia and she hits a face crusher, cover by Xia but it gets a two count. Xia goes for a kick but Toni ducks it and hits a release German, running hip attack by Toni in the corner and she hits a snap vertical suplex. Toni goes up to the top turnbuckle but Xia elbows her before she jumps off, Xia tosses Toni to the mat and covers her for two. Crucifix slam by Xia, she picks up Toni and elbows her in the chest, but Toni throws her into the corner. Buckle Bomb by Toni, and she nails the piledriver for the three count! Toni Storm is still the champion. Since the match was clipped down to under three minutes its hard to give a real opinion on it, but everything they showed was fine. Toni Storm is one of the best, she hits everything so crisp and I love watching her. Obviously too short to really recommend not a bad way to spend a couple minutes. Shanna won the belt from Kris Wolf on July 16th, and this is her first defense of the title. 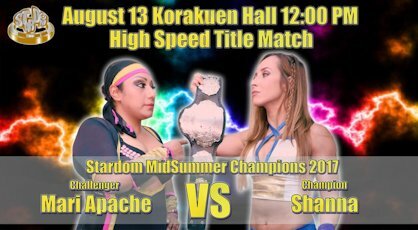 Mari Apache will be in Stardom until the fall, so it makes since that she would get a title match of some sort as she is a respected luchadora in Mexico. They had a singles match on July 23rd which ended in a double count out, but with this being a title match I am sure the referee will be a bit more lenient. Shanna has looked pretty good so far during this Stardom run and Mari Apache hits super hard, so there is potential here for goodness. Apache quickly armdrags Shanna around to start the match, but Shanna hits a spinning bodyscissors and dumps Apache out of the ring. Apache returns after a moment, Shanna elbows her into the corner before snapmaring Apache and kicking her in the back. Sleeper by Shanna, she lets go after a moment and knocks Apache into the corner. Irish whip by Shanna but Apache kicks her when she charges in, kick to the back by Apache and she puts Shanna in an armlock. She lets go of the hold after a moment, she tosses Shanna towards the corner but Shanna reverses it and hits a running elbow. Elbow smash by Shanna, and she covers Apache for two. Back up they trade elbows, drop toehold by Apache and she puts Shanna in the rolling Mexican Surfboard. Apache ties up Shanna’s legs, she then picks up Shanna and stretches her over her back. Shanna spins out of it and hits a hurricanrana, cover by Shanna but it gets a two count. Superkick by Shanna, Apache rolls out of the ring but Shanna quickly goes to the top turnbuckle and dives down onto her with a plancha suicida. Shanna and Apache return to the ring, elbow by Shanna but Apache blocks the suplex attempt. Enzuigiri by Shanna, she goes up top but Apache avoids her dive and delivers a heel drop. Shanna temporarily regains the advantage but Apache knocks her down with a lariat, sit-down powerbomb by Apache but Shanna barely gets a shoulder up on the cover. Apache picks up Shanna but Shanna reverses the slam attempt into a DDT. Shanna goes up top and hits a diving crossbody, but Apache rolls out of the pin and covers Shanna for two. Tiger Suplex Hold by Shanna, but Apache kicks out at two. Shanna goes off the ropes but Apache catches her with a Michinoku Driver, she goes up top and nails the Swanton Bomb for the three count! Mari Apache is the new champion! For whatever reason, this match never really clicked. I think part of the reason the match wasn’t gripping is there was just no clear structure to it, I never was sure what either wrestler’s plan to win was as the offense was so random. Apache knows what she is doing but her offense here had no rhyme or reason to it, and Shanna wasn’t very crisp as several moves didn’t connect as she intended. I think I actually liked their match on July 23rd better, something just felt off here. No lack of effort, it just never hooked me and didn’t have that title match feel. Io is back! Ok she wasn’t gone very long but with all the rumors about her (ranging from her injury being serious to her leaving Stardom altogether) its nice to see her in a Stardom ring again. She doesn’t miss a beat of course, as in her first match she is challenging for a title with her Queen’s Quest friends. Team Jungle just won the championships on June 17th, this is their first defense of the titles. 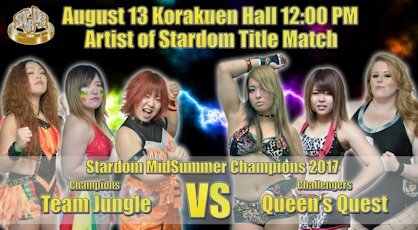 Viper left Oedo Tai for Queen’s Quest in late July, which is a significant upgrade over having AZM in just about every way possible. No real weak links here, as Io tries to put a belt right back around her waist again. Io and Kaori begin the match, they quickly get into a fast exchange with Io being Io, as she shows that she hasn’t lost anything in her month off. She tags in Viper while Hiroyo also tags in, Hiroyo works a headlock but Viper takes Hiroyo to the mat. Hiroyo quickly gets out of it, HZK and Kyona tag in next and Kyona hits a body avalanche in the corner. Scoop slam by Kyona but HZK avoids the body press, Viper comes in but Kyona avoids her body press as well. Io kicks Kyona from the apron and comes in the ring, and Kyona is triple teamed. Kaori and Hiroyo come in to help but they all end up being cannonballed by Viper in the corner, dropkick by HZK to Kyona and she covers her for two. Bootscrapes by HZK in the corner and she hits a running boot, she tags in Io and Io hits a running boot as well. Cover by Io, but it gets a two count. Io kicks Kyona and hits a double knee in the corner, she goes for another one but Kyona meets her with a hard shoulderblock. Kyona tags in Kaori but Io avoids her running senton, HZK comes in but Kaori fights them both off. Kaori picks up Io and hits Mongolian Chops, throat trust by Kaori but Io trips her and hits a slingshot dropkick. Io hits a running knee on Kaori in the corner and tags in Viper, bodyblock by Viper on Kaori but Kaori hops on her back and applies a sleeper. Viper drives Kaori into the corner to get her off, Viper charges Kaori but Kaori moves and goes for a suplex. Viper blocks it, Kaori goes off the ropes and she drops Viper with a DDT. She tags in Hiroyo, Hiroyo throws Viper into the corner and hits a body avalanche. Viper and Hiroyo trade lariats, Hiroyo crushes Viper against the ropes and goes for a suplex, but Io dives in the ring with a sunset flip onto Hiroyo. Crossbody by Viper and she hits a running senton onto Hiroyo for a two count. Viper picks up Hiroyo but Hiroyo hits a German suplex, sliding lariat by Hiroyo and she covers Viper for two. Hiroyo tags in Kyona but Viper also tags in HZK, Kaori goes up top and hits a missile dropkick onto HZK. Pump Kick by HZK and she applies a rolling cradle, but Kyona kicks out at two. Kyona sneaks in a pin on her own two count, lariat by Kyona and she gets another two count cover. Kyona goes for the powerbomb but Io flies in the ring with a swandive missile dropkick, Io dropkicks Kaori and Hiroyo but Hiroyo fires back with a lariat. Double lariat by Kyona and Hiroyo to HZK, Kyona goes for the cover but Viper comes in to break it up. Viper lands on top of HZK by accident, diving attacks by Kaori and Kyona but Kyona’s cover gets broken up. Kyona picks up HZK for the Hammerthrow Bomb but HZK gets out of it, Viper comes in and hits a jumping crossbody on all three Team Jungle members. Pump Kick by HZK to Kyona, but Kyona barely gets a shoulder up. HZK picks up Kyona but Kyona hits a lariat, Io runs in and kicks Kyona before dives out of the ring onto Hiroyo. In the ring, Viper knocks Kyona into the corner and hits the Michinoku Driver, then Io goes up top and nails a moonsault. Bombs Away by HZK to Kyona, and she covers her for the three count! Queen’s Quest are the new champions! 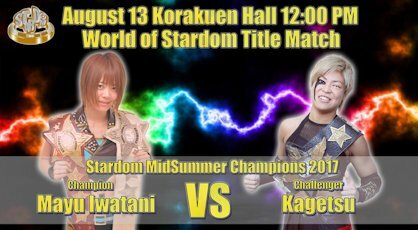 Mayu and Kagetsu’s long feud continues, as Kagetsu gets a shot at the top title in Stardom. These two have been feuding since the spring of 2016 off and on, at one point Mayu was recruited to join Oedo Tai but after she refused they started right back up again. Kagetsu returned from a brief hiatus in May and now is even more vicious than she was before, which she hopes will help her in her third singles match against Mayu (So far, Mayu is 2-0). Mayu won the World of Stardom Championship from Io Shirai on June 21st, and this is her second defense of the title. They start in the traditional fashion, with a tie-up, Kagetsu pushes Mayu into the ropes but she surprisingly gives a clean break. Kagetsu gets Mayu to the mat but Mayu springs up, hard shoulderblock by Kagetsu and they run off the ropes until Mayu hits an armdrag. Dropkick by Mayu but Kagetsu hits a back bodydrop, another dropkick by Mayu and both wrestlers kip-up. Snap German by Mayu but Kagetsu moves when Mayu goes for her dropkick and Mayu falls out of the ring. Kris and Hana beat on Mayu at ringside before sliding her back in, Mayu throws Kagetsu into the corner but Kagetsu avoids her charge and dropkicks Mayu in the knee. Kagetsu picks up Mayu and slaps at her, running knee by Kagetsu and she goes for a swandive dropkick, but Mayu dropkicks her mid-air which sends Kagetsu out of the ring. Mayu dives from the top turnbuckle down to the floor but Oedo Tai jumps her, Natsuko and Jungle come over to help though and Mayu gets free and chops Kagetsu into the crowd. Mayu pulls Kagetsu up near the balconies and they trade elbows, vertical suplex on the floor by Mayu and she goes up to the balcony. She goes to do a dive but Kris grabs her leg, Kagetsu joins Mayu up at the top of the balcony and Kagetsu hangs Mayu off the balcony. She drops her after a moment and Mayu falls down onto the steps below, Kagetsu brings Mayu to the steps and kicks her down them. Literally, Mayu tumbled down the stairs end over end like a bag of potatoes. Kagetsu slides Mayu back into the ring, she picks her up but Mayu slides away. Kagetsu kicks Mayu in the head, she goes up top but Mayu recovers and joins her. Frankensteiner by Mayu, she goes up top and delivers a missile dropkick. Cover by Mayu, but it gets a two count. High kick by Mayu and she delivers a German suplex hold, but Kagetsu kicks out. Mayu goes back up top and hits the diving body press, but that also only gets a two. A dragon suplex hold also doesn’t get a three count. Mayu drags up Mayu but Kagetsu gets away and Hana hits a missile dropkick while Kris has the referee distracted. Chokeslam by Kagetsu, and she covers Mayu for a two count. Ebisu Drop by Kagetsu, she goes up top but Mayu gets her knees up on the Oedo Coaster attempt. Mayu picks up Kagetsu but Kagetsu lands on her feet on the dragon suplex attempt, Sakauchi by Mayu and she drops Kagetsu on her head with a dragon suplex. Mayu nails her version of a dragon suplex hold, and she finally picks up the three count! Mayu Iwatani is still the champion! I wish I could have watched this whole show on Stardom World since so much of it was clipped, but the video quality was just too distracting. The matches that were supposed to deliver for the most part did, as the last two title matches were very entertaining. Shanna/Mari Apache never clicked however, and Toni/Xia was way too clipped to get a good feel of. Natsuko/Tam was a nice surprise, they elevated the lower card which is rare in Stardom as generally the first half of their events is skippable. Its great to see Io back and the main event was quality, overall a fun show.